Taken at about 4:45 pm in uptown Albany. 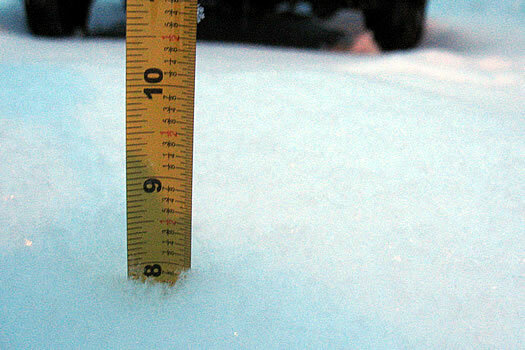 Albany got 12.8 inches of snow Wednesday, according to the National Weather Service. That's a record for the date. We're now up to 34 inches for the season -- which is a bit ahead of a typical year (25 inches by this point). The snow totals appear to have varied a fair amount by location. A handful of totals reported to NWS, listed by location, are after the jump. As you go farther east, the totals get a lot bigger. Some of the locations in western Massachusetts reported totals of 25+. And there were a few 30 inch reports in southern Vermont. I just measured 16 inches of snow in my backyard in Center Square. What's meant by "uptown Albany"? I always parse this in the Manhattan way, where down is south and up is north, but I'm getting the idea that uptown in the Albany context means the higher ground of New Scotland, or just the western radiation of Albany that's not "downtown", or something. Inform me, please. Also, do regular people casually say "uptown" and know what it means, or is it an affectation? Thanks. "Downtown" is widely used to refer to the core business, historic, or cultural district--very often all three--of any North American city, regardless of its geographic location. I don't have access to the originally cited works, but the wikipedia article on "Downtown" dates the usage to the early 1900s. As far as "Uptown Albany" is concerned, I've heard plenty of people around these parts refer to the western--well, more than half, really--of Albany as "uptown," usually meaning, roughly, everything west of Allen or Manning Sts. within the city limits. Lark St. and Center Square = Lark St.
From the end of Washington Park on Lake all the way to SUNY = Uptown, minus the college ghetto which you can pretend isn't there like most of us do. I've always been given the impression that the Lark Street/Center Square area is considered part of the downtown district, even though they have their own BID. As far as uptown goes, I sort of consider anything west of the park to be uptown, but then you also have WEST Albany, which sort of branches off of to the Northeast (tell me how that makes sense?) of Central Avenue down Everett and toward Colonie. North Albany and the South End are the only ones who are actually somewhat directionally accurate. Back when West Albany named, almost the entire city was located downtown and along the river (North Albany, South Albany). If you look at a map, that part of town is west of the Hudson and downtown, so there you have it.